The cost of fire damage restoration can vary widely depending on the type of fire and the size of the damaged area. Once the fire marshal declares your home or business safe to enter, your insurance agent should review the damage and take pictures he’ll need to complete your claim. Do not move items or attempt to clean until your insurance agent has a chance to do so. Damage from a small, fairly contained stove fire will be less expensive to repair than a damage from a more extensive kitchen fire. The size of the burned area and the type of the materials that burned will determine the final cost of cleaning and repairing the fire damage. Fires that consume natural materials, such as dry grass, produce less soot than those that consume synthetic materials found in many homes. Since cleaning soot is expensive, damage these natural fires cause will cost less to repair. 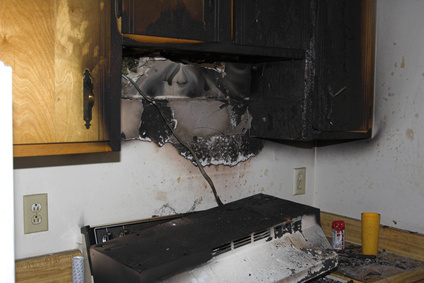 Damage from a simple stove fire may cost around $2,000 to $5,000 to repair, but it may cost $10,000 to $30,000 to rebuild a typical kitchen after a larger fire. If a fire spreads beyond a single room, you may need to rebuild your home, which can cost hundreds of thousands of dollars. Depending on the extent of the fire damage, many types of services may be necessary for complete fire damage cleanup. If smoke or ash penetrated the vents and the HVAC system, they will need to be thoroughly cleaned and deodorized to prevent smoke particles from being blown back into the house. There may also be water damage to repair from putting out the fire. Furniture and other possessions damaged by smoke, soot, or water may need to be removed to an off-site cleaning facility. Finding a fire damage cleanup service that you can afford is simple when you use the directory at RestorationMasterFinder.com. Read customer reviews to find the best fire damage cleanup service in your area and avoid unreliable or overpriced companies.